Are you a fan of sweet mochi? Mochi? For those who don't know... According to Wikipedia, mochi is Japanese soft chewy rice cake made of mochigome, a short-grain glutinous rice. Traditionally, mochi was made from whole rice with a labour-intensive pounding process that requires two people to pound, turn and wet the mochi in a steady rhythm. 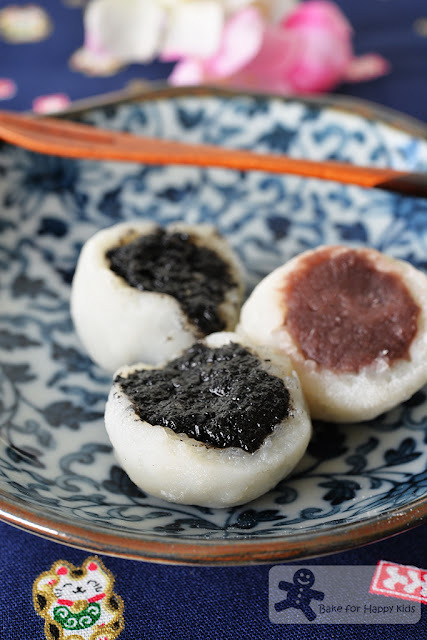 These days, mochi can be easily prepared by mixing sweet rice flour (also known as mochiko) with water to a sticky white mixture and is easily cooked by steaming or using a microwave until the mochi mixture become elastic and slightly transparent. So... Are we fans of mochi? Me? Nah. Not really! My husband? He hate it! My son? Absolutely!!! LOL! Due to many persistent requests from my son, I'm finally convinced that I will make mochi. As usual, the analytical me was searching for an ideal mochi recipe that is easy and also less-sinful with moderate amount of added sugar producing a soft and tender texture that we will enjoy. And YES, I have found one!!! Why is this mochi recipe so ideal? While searching for a mochi recipe, I have noticed that some mochi recipe are extremely fully loaded with sugar!!! So much that 1 cup of mochiko will require the addition of 2 cups of caster sugar!!! Good thing that I had searched further and saw that it is totally ok to add 1/4 cup of caster sugar in 1 cup of mochiko... Geez!!! Can you see the difference? The amount of sugar in the recipe that I'm using is actually 8 times lesser than some particular popular (based on its Google hit) Japanese mochi recipe and goodness me that I have noticed the significant difference! Many recipes have shown that mochi can be easily cooked by either steaming or using a microwave. For some reasons, I prefer not try and compare both methods and prefer only the steaming method. Why? The sort-of-scientific me actually believe that the wet steaming heat makes the mochi moister with a softer gel consistency. Besides, I like the fact that I can set up the mochi to steam for 20 mins and walk away within this 20 mins to do other chores. If I use the microwave, I know that I can cook the mochi a lot more quicker but I will have to stand in front of the microwave to microwave the mochi with short pulses of low power and stir in between every pulse. No right or wrong... Just my personal preference. Where can I buy mochiko at Melbourne? Tell me about this... I have been a crazy woman looking for mochiko at everywhere including online and every Asian grocery shops including very specialised Japanese and Korean ones!!! Imagine me... going to every shop, kept asking "mochiko mochiko mochiko" and shop assistants were giving me the "You the crazy woman" look!!! LOL! *You can find Diaso in Melbourne city or shopping malls in mostly Asians populated area like Doncaster and Boxhill. According to Just One Cookbook, Mochiko/もち粉 (also known as sweet rice flour or gyuhiko / 求肥粉 or daifukuko /大福粉) is a type of glutinous rice flour that is made from mochigome which is short grain type of Japanese glutinous rice and it is different from most typical glutinous rice flour that is made with long grain glutinous rice from other countries. 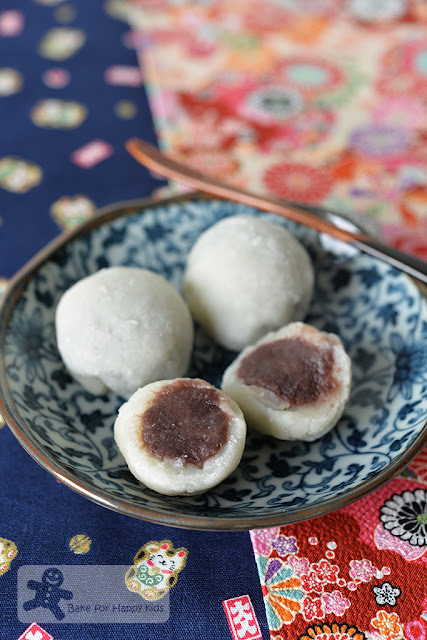 Therefore, please do not use any other type of non-mochi-making glutinous rice flour as it will make your mochi very different from the ones that is made with mochiko! This is the "mochiko" that I used. More mochi? I have also made some with homemade black sesame paste too! "Try this!" And I stuffed one of these mochi into my "mochi-hating" husband's mouth. Back to my question again... Are we fans of mochi? Me? Yes! My husband? Maybe! My son? Absolutely!!! And he is still loving it!!! LOL! Here's my one-minute video showing how easy to make these mochi in my kitchen. It's so easy that I'm sure you can make them too! Enjoy! 1/4 cup red bean paste if you want to make them without strawberries, plus more if you wish to make the plain red bean ones - See here and here for recipe to make your own smooth red bean paste. * For those who are living in Melbourne, Australia, you might wish to know that you can buy mochiko in most Daiso or sweet glutinous mochi rice flour in some Korean / Japanese grocery shops. 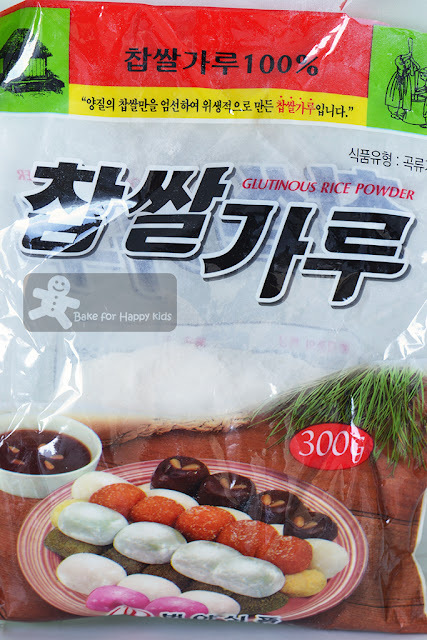 Please do not use other common glutinous rice flour. They are not the same! Fill a large pot with about 5-10 cm (2-4 inches) level of water and place a steaming rack in the pot without having the water level submerging the top of the rack. Using high heat, bring the water in the pot to boil. Combine mochiko, sugar and water in a heat proof bowl and mix until it forms a firm sticky dough. If the mixture is too dry, you can add 1-2 tbsp water to dissolve the dry mochiko that is stuck at the edges of the bowl. Please do not add too much water as too much water will make the cooked mochi too sloppy and difficult to handle. Cover the bowl tightly with a large piece of foil. When the water in the pot is in a rapid boiling state, place the bowl of mochi mixture in a steamer rack in the pot and cover the pot with a tight-fitting covering lid. Reduce the heat to medium with semi-rapid boiling water and steam for about 15-20 mins or until the mixture become gel-like-semi-translucent-looking. Cover the work surface with a large piece of baking paper or a large silicon mat and dust it generously with potato starch. Transfer the cooked mochi while it is still warm on the well dusted area and sprinkle more potato starch on top of the mochi. Wait for the mochi to cool slightly, then use a well dusted rolling pin to roll the mochi. Instead of using a rolling pin, you can use the traditional method to flatten the mochi by hand but I prefer to use the rolling pin as it will help to produce mochi with nice consistent thickness. Transfer the mochi with the baking paper or silicon mat onto a large baking tray and allow it to rest and cool at cool room temperature or in the fridge for about 15 mins or until the mochi is completely cooled and firm enough to handle. Remove mochi from fridge and cut it to large circles (sizes are depending on the size of mochi that you want to make) with a cookie cutter. Use a pastry brush to dust off any excess potato starch. To wrap, place one prepared filling in the middle of each mochi circle. Gather the edges of the mochi circle together to wrap the filling and pinch the edges together to seal the filling inside the mochi. Repeat the same wrapping step with the rest of the mochi circles and fillings. With leftover uncut mochi dough, roll into a ball and then roll into a thin layer again and cut out into more circles and repeat the same wrapping step to yield more mochi. Serve immediately or store in an airtight container at room temperature if you can consume all within the same day or in a fridge for up to 2 days. 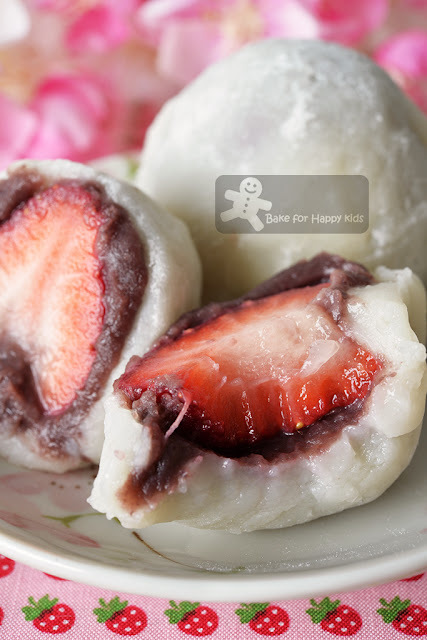 You can freeze mochi if they are not filled with strawberry. 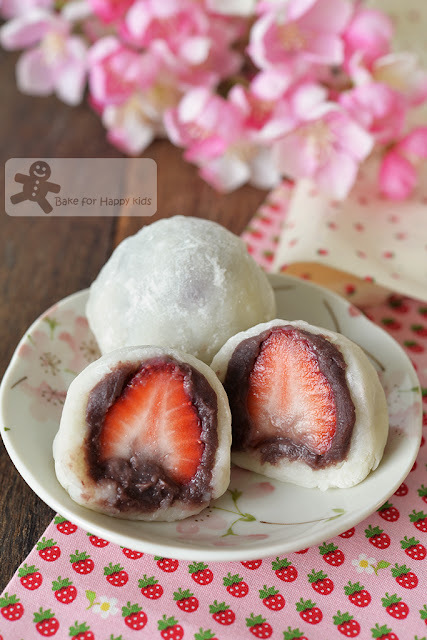 To freeze, wrap mochi individually in plastic wrap and freeze up to 2 months. To defrost, transfer the frozen mochi with the plastic wrap in the fridge and allow it to defrost overnight and enjoy it within the next 2 days. Lovely mochi, Zoe! Like you, I am not a fan of mochi, but my daughter is! She would be happy if I make this for her! Zoe, I am a fan of mochi! I love it! I can get the ready made ones and I cannot stop eating hah..hah... OK, I will study your recipe and I better make my own sine I read that there is so much sugar that goes into it. Eeeekkssss! !